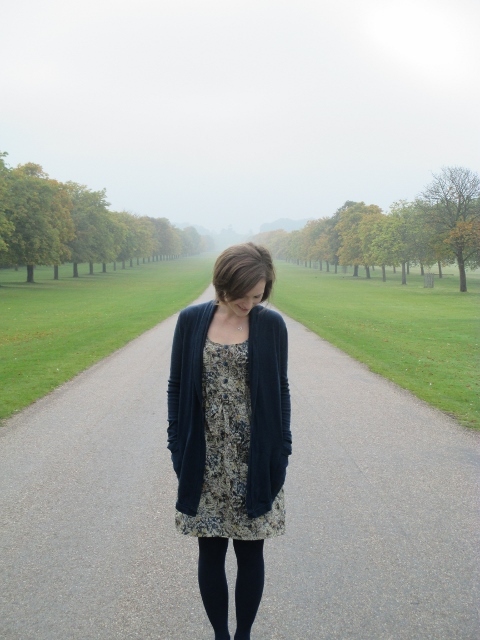 When I made my Autumn Southport dress, I wanted to further extend the wearability into winter. I’ve nailed layering with a long sleeve t-shirt underneath and a cosy cardigan on top but brrrrr the chills go right through tights. I wasn’t the fastest sock knitter so knitting wooly tights was out of the question (although I can’t stop browsing knitted tights on Ravelry and Pinterest!). The next best option was to sew some leggings. For the pattern I used Vogue 1440 modifying the tapered leg trouser silhouette to a fitted legging. 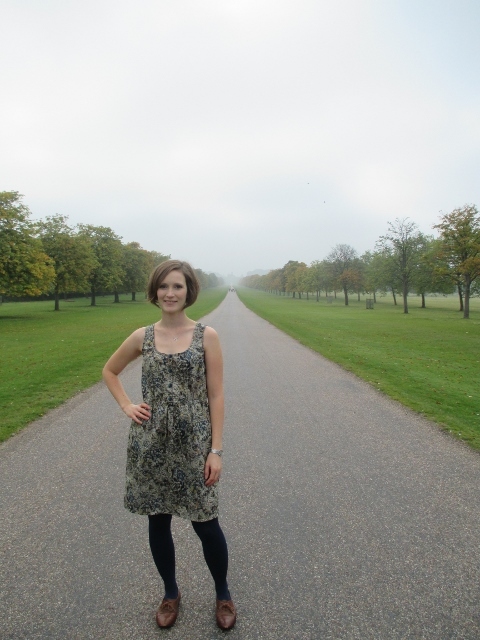 The pattern is intended for knit fabrics such as ponte so the alterations were relatively easy. I placed an online order for some navy and some mushroom ponte from Truro Fabrics. This ponte is really very good quality, it doesn’t have the sheen that cheaper options have and is incredibly soft for such a sturdy knit. 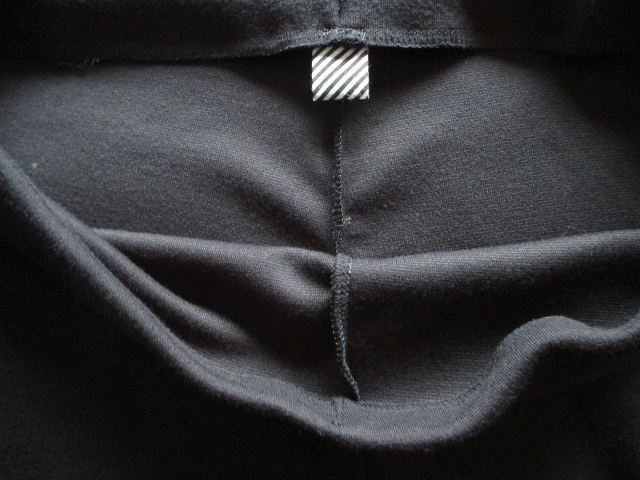 When I attached the elastic waistband, I also incorporated a ribbon tab at the centre back for easy orientation. Finally, I had some excess length that I should have just cut off and hemmed with a twin needle top stitch but I was overcome with an urge to turn them into ski pants. In the interests of fashion, do not try this at home kids. If you don’t care that 3 decades have passed since this look was ‘in’ then go ahead, cut a 2 1/2 inch slit for your heel, zig-zag or overlock the cut edge to reinforce it then enjoy the warmth provided by a second layer on your feet and the knowledge that your leggings will stay firmly in your boots this winter. It’s not often that I repeat a pattern but sometimes, just sometimes, a really good one comes along that allows for a variety of fabrics and spans multiple seasons. 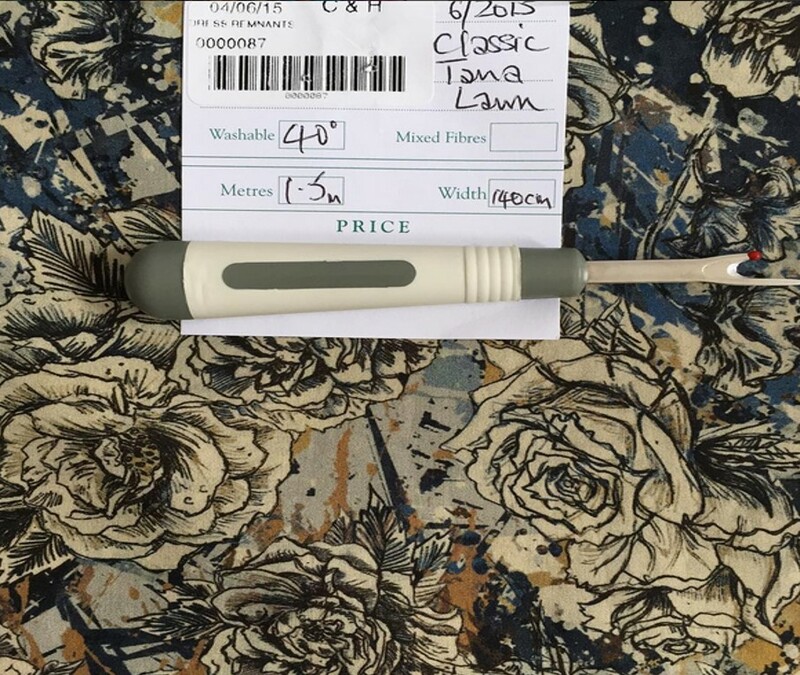 Finding a bolt-end of lawn on the C&H remnant table certainly helped push me towards a third True Bias Southport Dress. 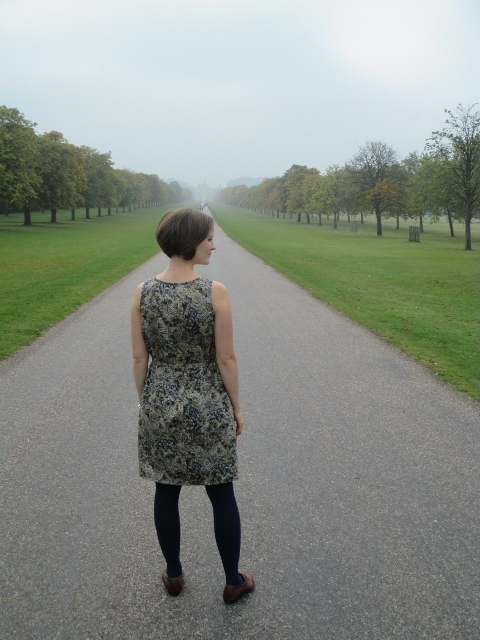 I knew I could fit a short Southport dress out of 1.5m because I had only 1.1m when I made my first purple paisley one (so I have 40cm left for another project!). 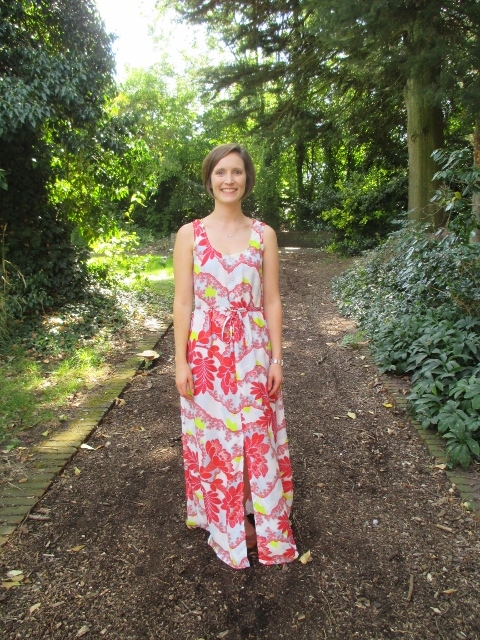 The changes I made to the pattern pieces for my neon maxi Southport were carried forward to this make. 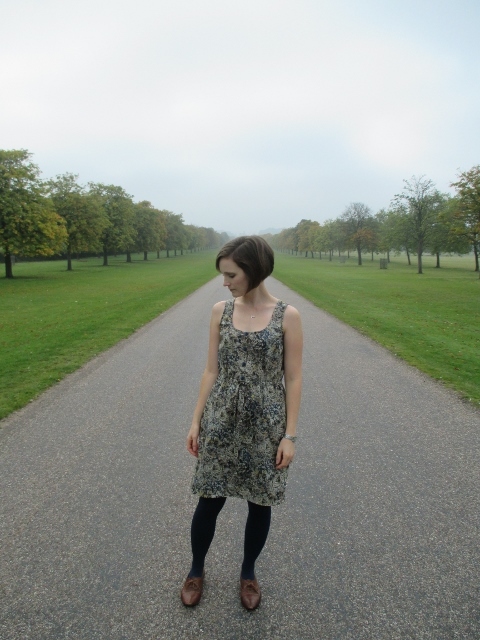 The colours of the lawn are particularly autumnal to me so a transition dress that I could layer up with tights and a cardigan (and maybe a long sleeve tee underneath towards winter!) was the look I was going for. I added a lining so that the skirt doesn’t ride up my tights and used satin bias binding at the neck and armholes. The buttons were selected by my husband because I was being indecisive… “maybe these ones, but these ones are nice too and I like these but I think they’re too big” You know how it is. Anyway, I agree now that he made a good choice. They have a slight ombre effect so I was careful to sew them on so that the direction of the gradient was all the same. 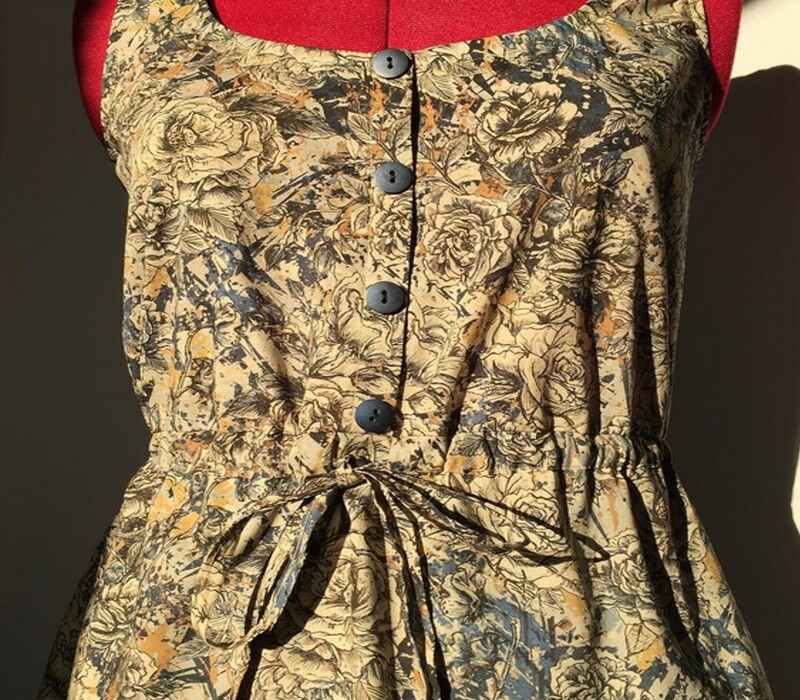 When I finished the dress and placed it on Thelma, the autumn sun was beaming into my sewing room and I knew it was going to spend more time in the washing basket than the wardrobe! This fabric has a much bolder print than I would normally wear. I had circled ‘the man outside Sainsbury’s’ stall on Walthamstow market a few times selecting a red jersey and a grey marl jersey (both plain, staple fabrics that easily fit into a wardrobe). It was a particularly hot day and this fabric kept catching my eye. I asked him to add a few meters to my bag figuring that the worst case would be using it for a drapey toile/muslin. The neon bias binding I tracked down on ebay. Despite selecting the colour via a computer screen, it turned out to be a pretty good match for the random neon green/yellow splotches on the fabric. 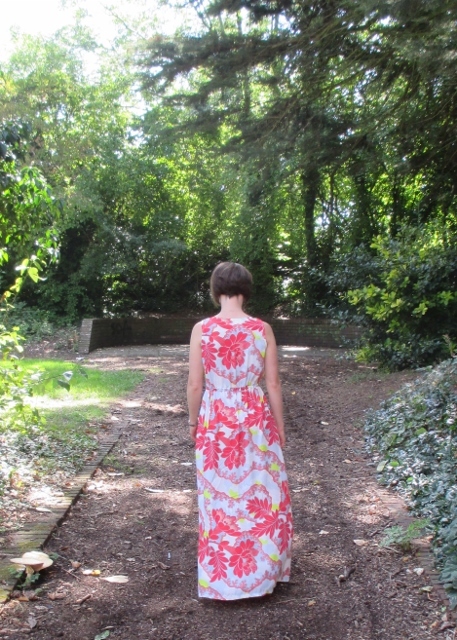 After making my first Southport dress, a maxi version leap frogged my sewing queue to meet an end of summer deadline. 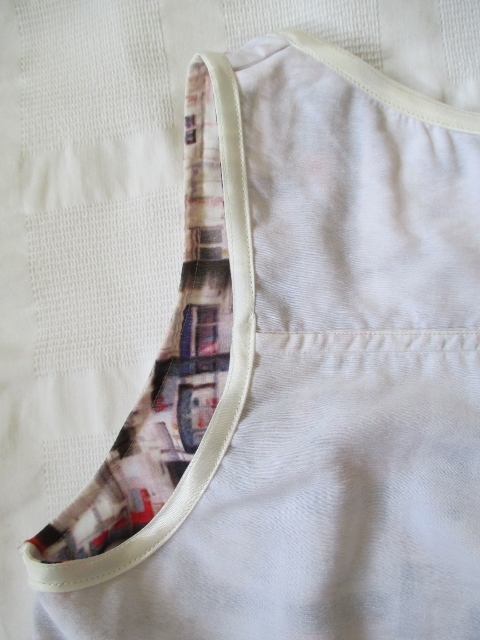 I removed some excess fabric from the skirt and bodice at the back and raised the neckline by half an inch. Other than that, the details for the pattern were the same as my previous make. I had a long hard think about pattern placement. A large flower on my back, I am fine with but I really didn’t want one on the front bodice. Yet, on the front I had to do some pattern matching at the button placket or it would have looked too haphazard. I’m still not sure it’s quite the right print for me but I’m willing to give it a few test wears before making a final decision whether to add it to the charity shop bag or not. 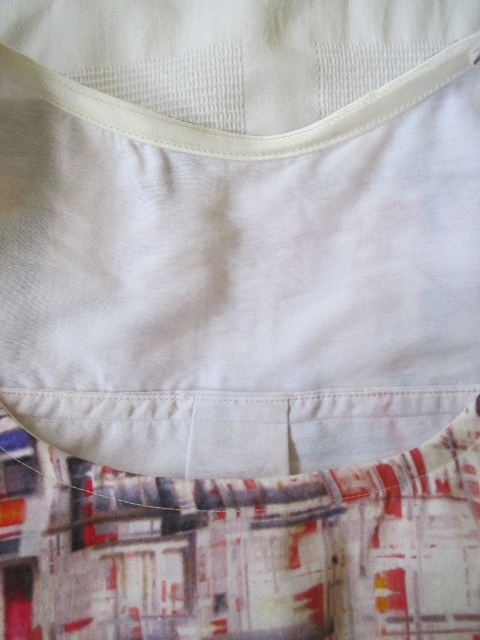 As for the other purchases: the grey marl jersey is cut out and the red jersey it is awaiting blog photos. I hope you are enjoying the summer as much as I am. 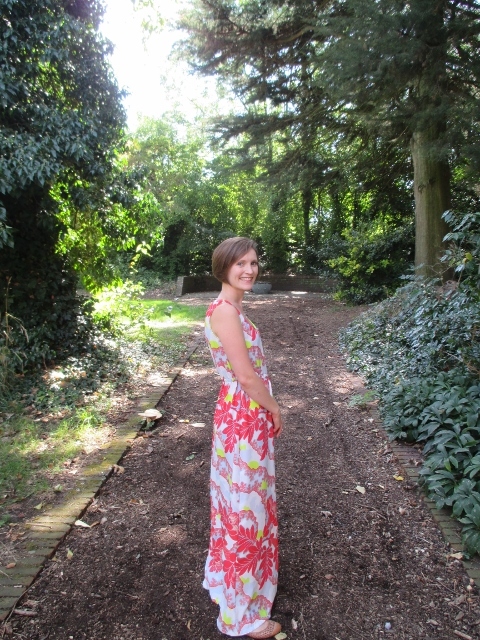 Between sunny weekends, weddings, christenings and birthday barbecues, I haven’t done much sewing. 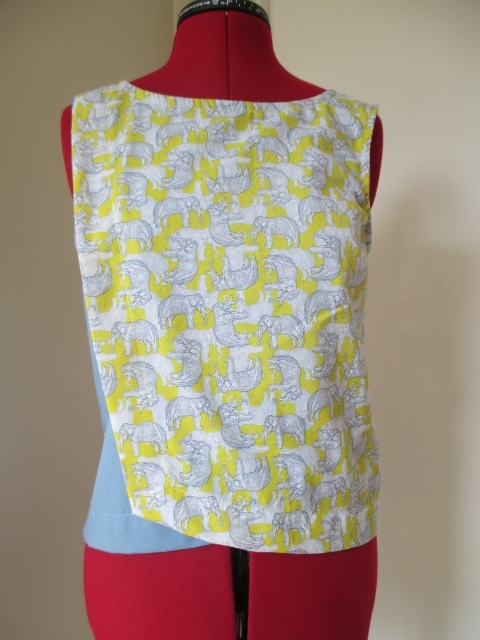 However, my latest finished items epitomises summer and was finished just as the rain arrived: a cotton voile tank. Have you heard of Liola Patterns? I hadn’t either till I saw Elena’s Ella Tank. 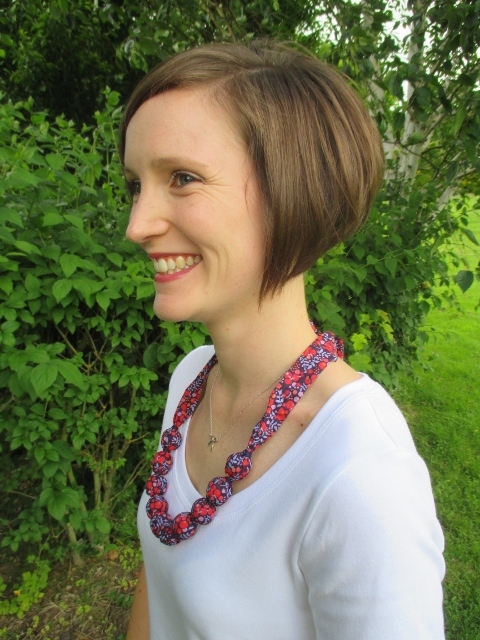 The yoke and pleat caught my attention and the easily wearable shape helped me to justify the pattern purchase! 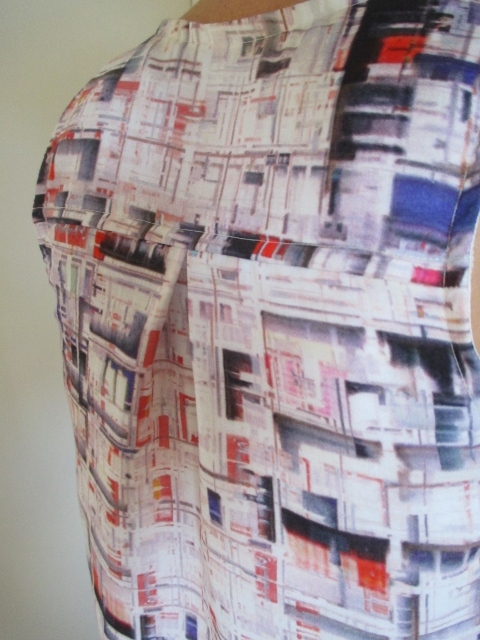 The fabric was spotted during an idle ebay browsing session (ebay seller: ontrendfabrics). I was won over by the abstract print, colours and because I hadn’t sewn with voile before it was going to be a new fabric experience.When it was delivered, the voile was (excuse my ignorance if you are a fabric identification whiz) a lighter, more sheer version of lawn. Yep, all the joy of being easy to sew coupled with a surprising amount of drape for a cotton. 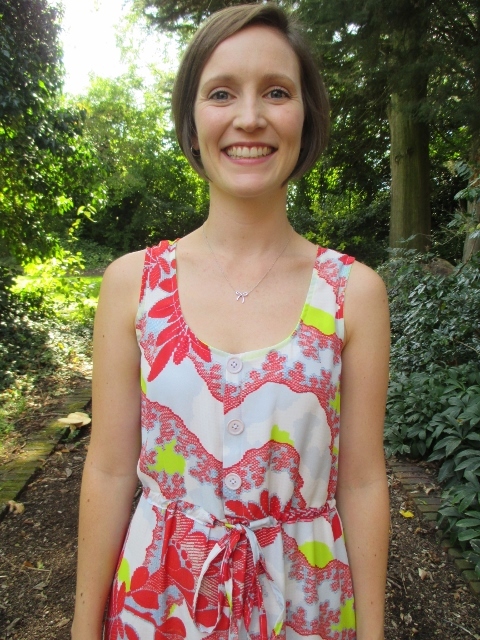 The drape and sheerness was lovely but just a little too indecent to be worn as a top – I underlined in plain white voile which made the bright colours pop just a little more. 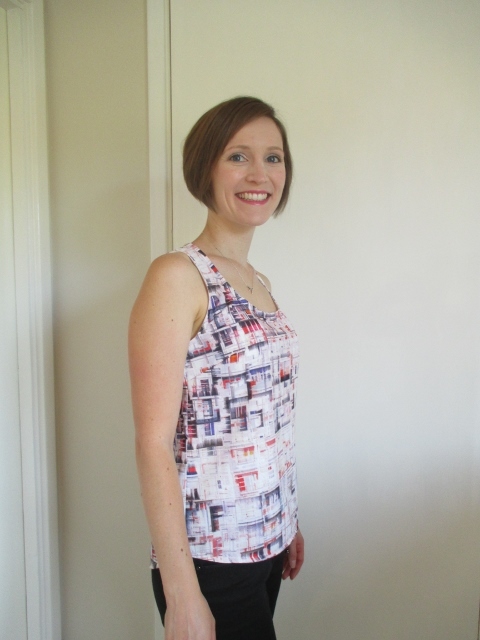 The Ella tank pattern has a faced yoke but having already underlined the shell fabric, I French seamed the yoke seam and omitted the facing. 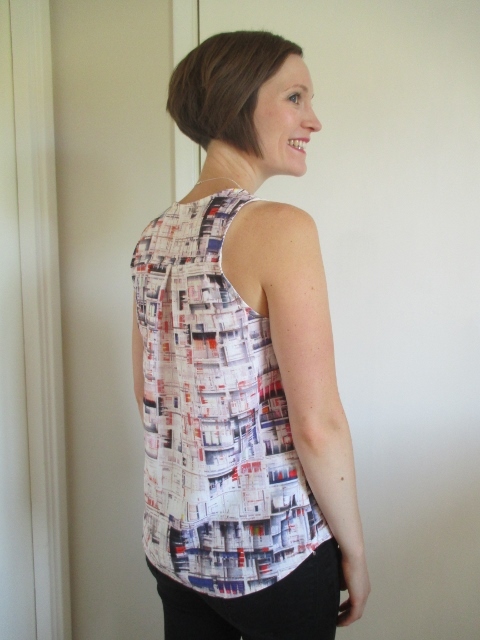 And why stop there, I French seamed the shoulder and side seams too – a great way to turn a quick project into something more substantial and double the sewing time required to complete it! 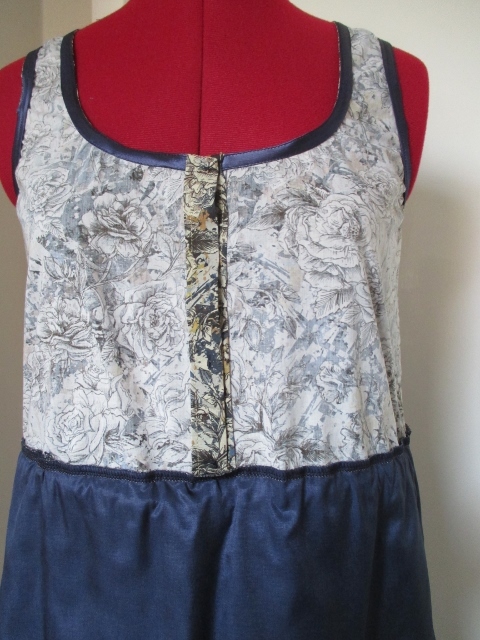 The neckline and arms are finished with bias binding so I echoed that stitching by top stitching the back yoke. I made a few alterations to the pattern pieces: raised and rotated the bust darts, lowered and scooped out the armscye, graded in at the waist, full hip adjustment and a forward shoulder adjustment. Some typical alterations for me and a couple of new ones. I’m happy with the end result though. Very wearable and very me. 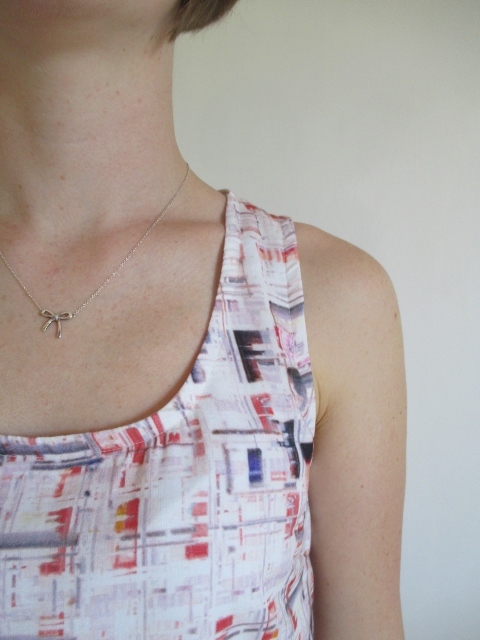 There’s been a wave of t-shirt sewing among the blogging community lately. It’s great that we’re embracing sewing the basic items we wear frequently and shunning RTW. I had a tip off that the white t-shirt jersey from Brunswick Mills (ebay seller: brunswickmill2013) was good quality: excellent recovery, washes well and has high opacity. I can fully recommend this fabric on all factors but it scores top markes for non-see-through-ability. 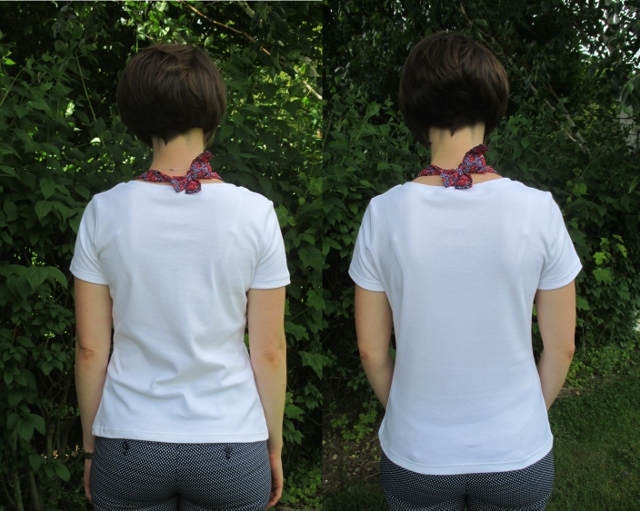 I used this t-shirt as an opportunity to test a few more tweaks to the Sewaholic Renfrew pattern based on the fit of my previous versions (Cowl and Long sleeve tee). With a bit more grading between waist and hip, mostly on the back pattern piece, I hoped to avoid a sway back adjustment… sadly not to be. Here I’m displaying the pooling in all it’s glory and with the t-shirt pulled down. The problem with a sway back adjustment on a garment with no centre back seam is that making it with a horizontal stripe fabric becomes impossible. The adjustment causes the hem line to rise up, the grainline gets skewed and the stripes end up all wonky. 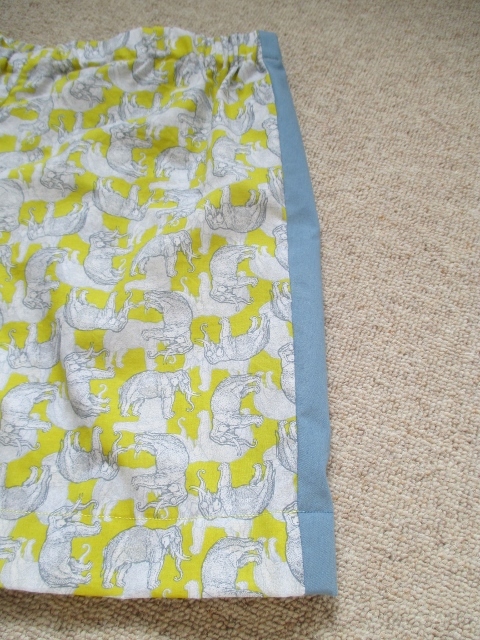 So my choice is to either add a centre back seam (really on a knit?!) or to be limited to non-stripe/non-obvious horizontal patterned fabrics. What a predicament to be put in. 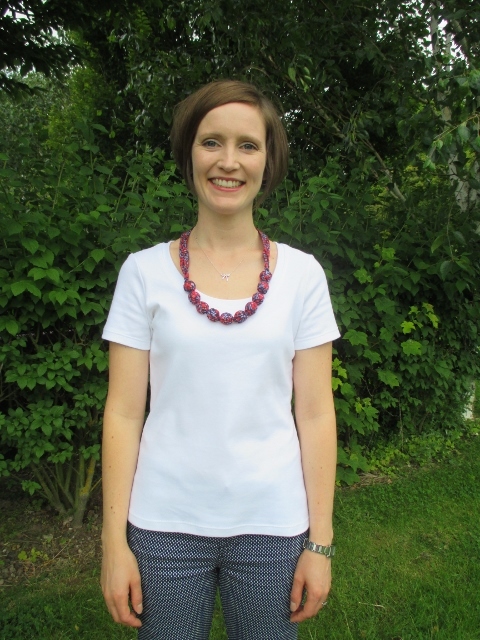 Fabric necklace is still going strong after two years, I wonder whether the white t-shirt will avoid food stains for that long. What did you sew this weekend? My penchant for elephants (see here for evidence) and lasting habits of last years’ stash diet have produced a rather interesting pair of pyjamas. 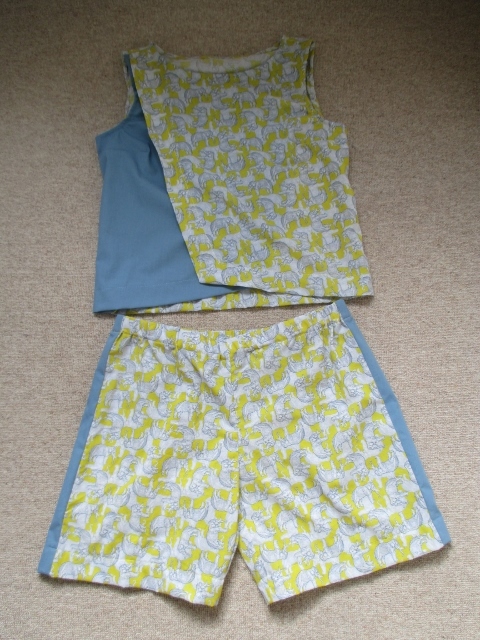 The weather is heating up here in the UK so some shorts pyjamas were thrust to the top of my sewing list. I hadn’t intended them to turn out quite so Muai Thai shorts-esque but I didn’t have enough elephant lawn leftover for both a top and shorts. The contrasting cotton remnant (also from my stash) seemed a good idea at the time. I used a self-drafted pyjama bottoms pattern and made them as long as I could with the fabric I had. Using a 4cm hem to match the hem of the top, I got all particular and changed thread colour for the side panels. 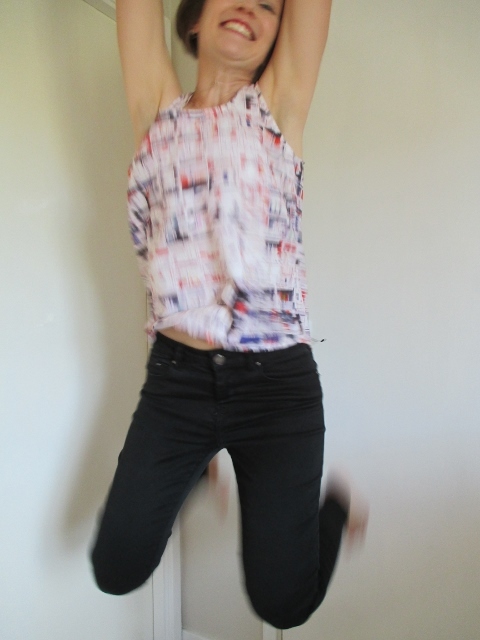 The top was a proof of concept make: Could a contrasting fabric work for the front pieces of Burda 04/2014 blouse 115? And could I competently re-draft the armscye to be sleeveless? 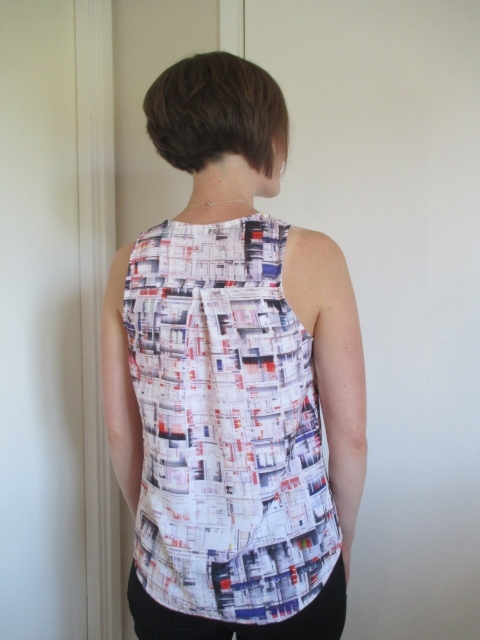 No and yes respectively – although if you’d asked me to guess prior to sewing I’d have said the contrast was certain to work but my drafting would be doubtful. As pyjamas it’s fine but I don’t think a contrast front can be achieved without some finely honed skills in fabric selection. Which I don’t have. I struggle to mix more than one print/colour into a garment so mostly I opt for matching facings/bindings/lining and avoid combining fashion fabrics all together. 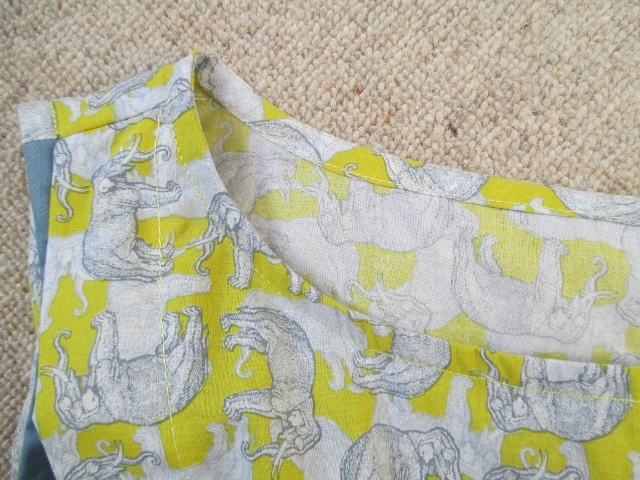 I envisage sewing another shorts pyjama set in the near future… I’ve been online browsing for suitable fabric!